Coffee. Definitely coffee. I never used to be much of a coffee drinker until I met my wife. Now the morning drip is an absolute necessity. Preferably intravenous. Thanks Lisa. There’s nothing like a mug of thick chicory Café Du Monde. There’s nothing like drinking a mug of thick chicory coffee and munching on beignets on the patio of the Café Du Monde shop in the French Quarter at 10 o’clock in the evening. I live in Denver, so I don’t get to do that too often. Juggle, read, sing, and lay in the sun. I’m quite effective at the latter. I used to play the violin. I have a law degree and a license to practice. I’m not currently practicing law, but I am using my legal background in my current job in the corporate world. Escape from Loki: Doc Savage’s First Adventure by Philip José Farmer. Many different kinds, except Country. ’80s New Wave. Echo & The Bunnymen, Hoodoo Gurus, Joy Division, Depeche Mode, The Police, The Cure, The Clash, The B-52s, too many others to name. Some ’60s like The Beatles, The Doors, and The Kinks. More recent favorite bands are The Dandy Warhols, Lush, The Killers, Franz Ferdinand. Yeah, I like Coldplay too. Then the crooners. Harry Connick, Sinatra, Tony Bennett, and so on. Jazz: Glenn Miller, Count Basie, Duke Ellington, Billie Holiday, you get the idea. Classical, I listen to the usual, Mozart, Bach, Beethoven, but I also love Holtz, Rimsky-Korsakov, Tchaikovsky, Pachelbel, and Brahms. Outline. I write the full outline, map out all the characters and the plot, and then actually write over it, adding in the detail and dialogue, and erasing the bits of completed outline as I go. This also allows me to jump around. I tend to write the story beginning to end, but if I get stuck I jump to another scene or even the end and write that first. By the time I’m done with a different scene, it’s usually clear how to resolve the other scene on which I was stuck. You can probably tell from my bio that Philip José Farmer and his works are the largest influence upon me. I might not be writing now if it weren’t for my fascination with his Wold Newton biographies, genealogies, and stories. His writing has so many layers. They’re like puzzles. Every time I reread something by Farmer, I always find something new and intriguing, clues pointing to something else, some new hint to pursue and analyze. Despite my fascination with Farmer’s work, I do read a lot of other stuff. Sir Arthur Conan Doyle, Sax Rohmer, H. Rider Haggard, Raymond Chandler, Ian Fleming, Edgar Rice Burroughs, Dashiell Hammet, Jules Verne, Lester Dent, Walter Gibson, H.G. Wells, John D. MacDonald, Robert E. Howard. Hmm, all the stuff that influenced Phil. What a surprise. Kim Newman and Alan Moore. Howard Waldrop, Joe Lansdale. Tim Powers and James P. Blaylock are favorites. Win Scott Eckert holds a B.A. in Anthropology and a Juris Doctorate. In 1997, he posted the first site on the Internet devoted to expanding Philip José Farmer's concept of the Wold Newton Family, The Wold Newton Universe. He has recently served as an expert consultant on crossovers involving characters from pulp fiction and Victorian literature for a lawsuit concerning a major motion picture. 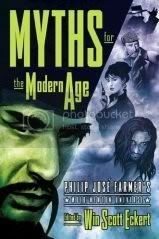 Win is the editor of and contributor to Myths for the Modern Age: Philip José Farmer's Wold Newton Universe (MonkeyBrain Books, 2005), a 2007 Locus Awards finalist. He has written pulp tales for a yearly anthology of Wold-Newtonish stories, Tales of the Shadowmen volumes 1-4 (Black Coat Press, 2005-2008), mostly centered on the adventures of Doc Ardan, a French version of Doc Savage. He has also written stories for Lance Star-Sky Ranger (Wild Cat Books, 2006) and the upcoming Captain Midnight: Declassified (Moonstone Books, 2008). He is a regular contributor of Wold Newton essays and stories to Farmerphile: The Magazine of Philip José Farmer, and he was honored to contribute the Foreword to the new 2006 edition of Philip José Farmer's seminal "fictional biography," Tarzan Alive: A Definitive Biography of Lord Greystoke (Bison Books, 2006). Win's latest book is Crossovers: A Secret Chronology of the World, coming in 2009 from MonkeyBrain Books. He is also working on a novel.